The Lunar New Year (Seollal) holiday is just around the corner and that means that studios are looking to draw in large crowds, particular families, during one of the peak theatergoing periods of the year. Making a film that can appeal to everyone isn’t child’s play and oftentimes it means that studios will resort to mixing disparate elements to suit varying tastes. It’s a gamble but one that Korean filmmakers have never shied away from. Such is the case with Man in Love (formerly When a Man Loves a Woman), the new film from studio Next Entertainment World (also behind last year’s breakout Seollal hit Miracle in Cell No. 7). Low-level thug Tae-il struts through streets and markets, shaking down shop owners for protection money for his small gang. Though good at his job and well liked by his boss, his conscience perks up when he meets Ho-jung, the daughter of one of his targets. Over time an unlikely romance blossoms between the two but trouble with his gang when he decides to call it quits and a cancer diagnosis drive them apart. 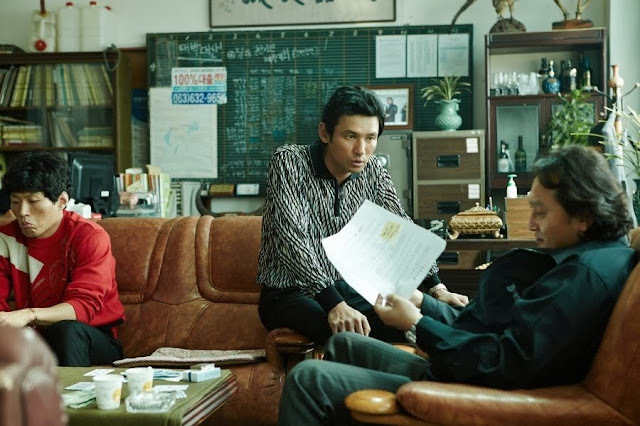 Man in Love dabbles in four genres: romance, gangster, family drama and tearjerker. These follow each other more or less in sequence and this turns out to be a surprisingly effective technique as some chronological back and forth keeps the narrative fresh, or at least for the first 90 minutes. When the film inevitably turns on the waterworks in act four, the film’s measured tone gives way to melodramatic excess. Wordless scenes where characters meet and begin tearing up can be effective when used sparingly but here the trick is abused. The image of two characters wailing as they face each other, 20 feet apart on a snowy night, was the point at which the film lost me. It’s a great shame as there is three quarters of a strong melodrama here. Though hardly novel, the lengthy courtship leading to the romance is endearing, the gangster machinations are engaging and even the family elements are snappy. Anchoring all those of course is the great Hwang Jung-min, who is definitely the lead in this picture. It’s familiar territory for the veteran star as the terminal illness romance logline already prompted many to compare it to his 2005 hit You Are My Sunshine, alongside Jeon Do-yeon. The gangly Tae-il is a colorful and layered character that Hwang deftly brings to life with his prismatic delivery and elastic expressions. 26 Years star Han Hye-jin, as the romantic interest, is given a reticent character that affords her little opportunity to make an impression beside the magnetic Tae-il. Her performance is reserved to the point that when she is called on to turn her head and face someone during an emotional scene, her movement is so slow as to be almost imperceptible. Kwak Do-won, following his terrific courtroom scenes alongside Song Kang-ho in The Attorney, once again does some great work here in a supporting role. Debut director Han Dong-wook, the assistant director of Ryoo Seung-wan’s The Unjust (2010, also starring Hwang), acquits himself well by presenting a film with a pleasant and rustic tone. Opting to keep the focus squarely on the actors, Han’s clear direction gives the cast ample opportunity to shine.